Our longtime friend Lyle Campbell, a geology prof at USC-Spartanburg, is deeply involved with the local Audubon chapter and alert for rare and unusual birds in his neck of the woods. Last week, he took a call from Nancy Gergen of Boiling Springs SC (Spartanburg County) and went with wife Sarah to observe an apparent Rufous Hummingbird at the Gergen residence. Knowing the importance of positively identifying this winter vagrant, the good Dr. Campbell contacted Hilton Pond Center, and we were quick to arrange a trip to the Gergens' for 20 November 2002. 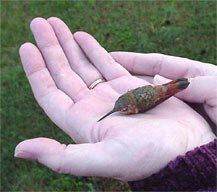 Measurements of the Boiling Springs bird ruled out that it was an Allen's Hummingbird, Selasphorus sasin, and confirmed Rufous Hummingbird, S. rufus. 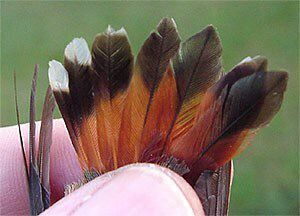 The bird was already bringing in some of the rusty back feathers that are another sign of an adult male Rufous (above). 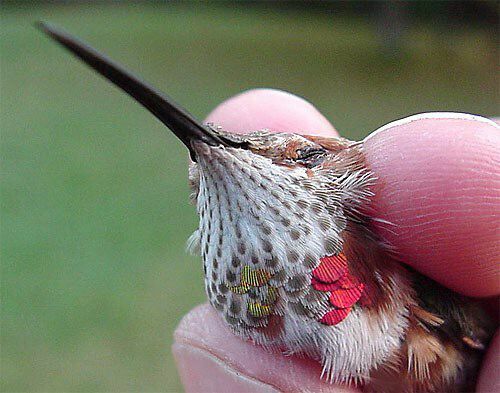 In previous years, none of our banded vagrant hummers has kept its eyes shut for the entire banding process. Howeever, the Boiling Springs bird--like almost all the vagrants we have banded in 2002--was a "squinter" (top photo and below). Other banders we queried about this behavior said squinting happens occasionally happens when they band hummers in full sun, but most of our recent bandings have been on very overcast days and quite early in the morning in fairly dim light. Thus, we're at a loss to explain this "new" behavior epidemic. We appreciate Lyle Campbell's alerting us to the Boiling Springs hummer, but especially thank Nancy Gergen for allowing us to band her Rufous at dawn. 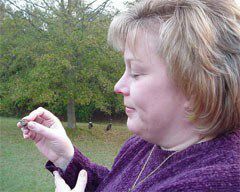 The bird seems pretty attached to Nancy--it was first spotted at her feeder about 1 October--and certainly wasn't in any hurry to fly from her hand after banding (below left).